We continue experimenting with the use of the Smooth-On XTC-3D after we recently shared our first experience using it. This time we used Natural PLA filament for our tests as we wanted to see will the use of the XTC-3D help in improving the transparency of the printed parts. Last month there was an interesting article about using the XTC-3D for improving the clarity of the Taulman T-glase, so we wanted to see if there will be a similar effect on parts using the semi-transparent Natural PLA filament. The initial results that we’ve had with parts that we have already printed and decided to use for tests were not very good as apparently the 3D printed part with that you want to be more transparent will need to be specifically printed with thin walls. So we gave up on experimenting with improving the transparency on already 3D printed parts with Natural PLA, and while we also wanted to try out the Taulman’s tutorial for T-glase filament we had trouble with the filament sticking properly to our build plate covered with standard 3M ScotchBlue tape on the MakerBot Replicator 2 3D printer that we are using, so we have postponed testing with that material and XTC-3D for a later time as well. What we have decided to do instead was to coat the 3D printed parts with XTC-3D, then sand them and paint them with a standard spray paint used for coloring plastic materials. We have started with a Batman logo that we have printed with Natural PLA filament, left to right on the photo: the 3D printed logo, the logo sanded with fine sanding paper getting a more matte look and then painted with black metallic spray paint. The end result is really nice and smooth surface after the sanding and painting, though we did not do great with the painting part, but we did it in a bit of a hurry. As we have mentioned the 3D printed parts that we have used here for testing are not good for testing to improve the transparency of Natural PLA filament as they are tick objects with infill like is the case of the Batman logo, but even with multiple shells and without infill it is hard to improve transparency. You would probably need to use less shells with no infill and maybe larger layer height to get better results with improved transparency on Natural PLA as the recommended setting for T-glase suggest. The Batman logo is easier to coat with XTC-3D and sand and paint, so we decided to also try a bit more complex 3D print – a small trophy cup. We have already had a few of these printed, so it was easy to compare before and after. On the photo above you can see the 3D printed cup on the left and the same cup coated with XTC-3D and sanded on the black background. You may notice that the coated and sanded cup still does show some noticeable lines for the layers, even though the surface is actually smooth – this is a result f the transparency of the material. On the right part of the image above you can see the already painted cups, the one that is coated with XTC-3D and sanded (inside and outside) on the left part and the one that is directly painted after being printed. Again not perfect painting on our side with some dust particles getting caught by the paint, but you can clearly the very smooth surface of the coated and sanded part. Even without sanding the 3D printed parts that are coated with XTC-3D that are painted after that may look great, but sanding may help in getting the paint to stick better and be more durable on the long run. We are going to continue experimenting with the Smooth-On XTC-3D coating as we like the results so far, though it does need to getting used to and trying out different with settings for the 3D printed parts depending on what are the final results that you want to achieve. We finally got our hands on a XTC-3D 3D print coating from Smooth-On, though it was not very easy to find it as most companies selling 3D printers and accessories for them still do not offer that product – we had to find Smooth-On partner in Europe and order it from them. We got the larger 24 oz (644 grams) package as the smaller one turned out to be cheaper than what we’ve had to pay for the shipment costs, and anyway if we liked the result after testing the coating we would want to have some more to play with. Once you get the package it is very wise to read the manual very carefully and do try the use the XTC-3D coating a few times on test prints, before actually trying to apply it to 3D printed parts that are more important. Also you would probably want to get some small size paint brushes for applying the coating to smaller 3D printed objects with more details, as using a large size brush on small 3D models is not a wise idea if you want to get good quality. Interestingly enough the XTC-3D 3D print coating can be used in multiple ways – to coat models providing a glossy and smooth surface effect, to coat them, then sand them and paint, or to apply color to the coating and coat the model with color. It all depends on what is the end result that you want to achieve in the end, what you need to be well aware of however is that properly using the XTC-3D coating does take some getting used to in order to achieve best results and it also takes some time for the coating to cure and additional time if you want to further process the 3D printed part. We have started our testing with a 3D printed Yoda bust using PLA filament with a 0.3mm layer resolution, so the resulting print was with very easily distinguishable layers and not very smooth. The initial coating of the 3Dpritned part with the XTC-3D did make the layers of the print less apparent and the Yoda bust having a more glossy finish than what the original print had. We needed a second layer of coating with XTC-3D however in order to make the surface of the Yoda bust seem really smooth to the touch, although if looking up close you could still distinguish the texture of the different layers. The reason that you might still get to see very faint lines from the different players with a lower printing quality is that the XTC-3D coating is transparent, so even if ti makes the surface really smooth and glossy you may still need to apply some paint for 3D printed parts that use lower quality for the printing. The end results with 2 layers of XTC-3D coating to our roughly printed Yoda bust was really nice, smooth and glossy surface, though a bit of sanding on the ears and applying green paint could produce even better results after that. Next up was trying out the Smooth-On XTC-3D coating on a few more exotic filament types – Carbon PLA from Proto-pasta, Laywoo-D3 and LayBrick from Orbi-Tech. using a 0.2mm resolution for the test prints we have applied 1 layer of XTC-3D coating to each of the objects – on the left is the normal print and on the right you can see the same 3D model with 1 layer of coating applied. The result with just a single layer was not that good, the coated 3D models got slightly more smoother, but with the layers still easily distinguishable and more noticeable was the fact that they became glossies as the normal results when printing with the filaments produce more matte look. Adding a second layer may improve things, but the highly glossy end result might not be to your liking that much and sanding and painting on top of 3D printed parts when using materials that produce carbon, wood or stone look is not the best idea as it will ruing the realistic look that they do provide. We have also tried applying XTC-3D coating on NinjaFlex 3D printed keychain with the Nvidia logo, even though that might not be a very wise idea as this is a flexible filament. When you apply XTC-3D coating it hardens a bit the 3D printed part and make it less flexible, so this makes it unsuitable for flexible filaments as it will reduce their flexibility. After applying a single layer of coating to the 3D printed part with NinjaFlex filament we have observed the expected slight improvement in the surface feel – smoother as well as the keychain becoming glossier. Although the surface felt smooth, the topmost layer having a large surface area did not not look much more smoother tan before coating it, so XTC-3D might not work that well on flexible filaments such as NinjaFlex. The more interesting thing that we have observed is that after applying the XTC-3D on the NinjaFlex 3D printed keychain it has remained quite flexible, but stiffer than it was before the coating. You should however avoid flexing too much NinjaFlex printed parts if you have coated them with XTC-3D and also that if you apply multiple layers of coating their flexibility will most likely be reduced significantly. 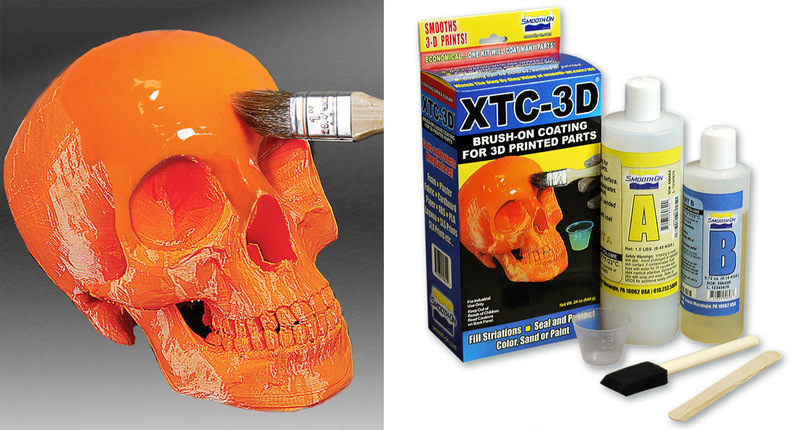 So what ware our first impressions from using the Smooth-On XTC-3D coating? We are pretty satisfied with the results we got, although our first tries were not perfect we quickly got the hand of using the coating and the results started improving. When you get used to take advantages that the XTC-3D coating provides and you properly use it on 3D printed parts you can achieve really nice results in terms of final quality of the things you 3D print. The coating however is not perfect and suitable in all cases and for all kinds of materials, so you should be careful how and when you use it. You should also be prepared to spend some time for the extra finishing if coating 3D prints with XTC-3D as it does take some time to do it and then a few hours for the coating to fully cure. If you then plan on sanding and painting the coated part it could easily take a whole day, but if properly done the end result might be something that you can hardly believe was something that was 3D printed. We are going to keep experimenting with the XTC-3D coating, so expect more of our feedback pretty soon – next up is to get more experience with sanding and painting some 3D prints after getting them coated with XTC 3D. One of the drawbacks of the FDM (FFF) 3D printing method is that the result of your printing is a model that is not totally smooth to the touch, you can see and feel the texture created by the layer by layer printing by extruding the thermoplastic material. The smaller the layer size the less noticeable the texture of the printed 3D model is, but it is till there and some people just want to get a smoother glossy or matte object as a result of their 3D printing. There are multiple solutions for smoothing the surface of your ABS or PLA 3D prints to make them look even better as a final product and not seem so much like they were actually 3D printed. The most commonly used approach seems to be the use of various solvents that can help you get a smoother look of the surface of different 3D prints, but you need to be careful with these as solvents might be dangerous to your health and if not properly handled you can also damage your 3D printed models. One of the most commonly used methods for smoothing the surface of 3D prints made with ABS material is to use Acetone as it melts the ABS plastic and creates a smoother and glossy looking surface. 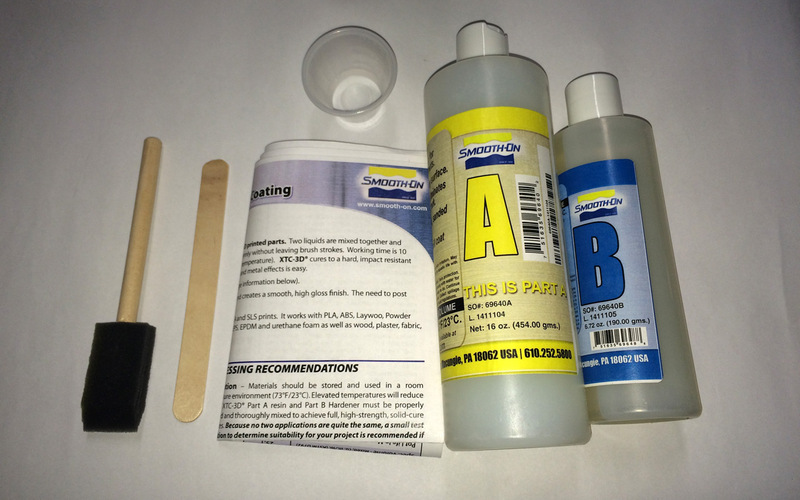 The there are various ways for the application of Acetone for smoothing ABS prints that may produce varying results, so you might want ot try them all and experiment to see what works best for you and gives you the best results. Some people dip the model in acetone, some apply it on the model with a brush and some use Acetone vapors to melt the ABS plastic and give it a smoother finish. Regardless of what you use however you should be careful with Acetone and try to avoid inhaling and also be careful as Acetone is highly flammable. Another alternative to Acetone that might give you the same results for smoothing ABS prints is Methyl ethyl ketone (MEK), also known as Butanone, as some people report successfully using this instead of Acetone. Do note that Acetone and MEK do not seem to work well with PLA filaments like they do with ABS, so do not try them for smoothing PLA 3D prints! For smoothing the surface of PLA 3D printed objects it seems that so far the best working solvent providing similar effect to Acetone for ABS is Tetrahydrofuran (THF). THF not only works for PLA like Acetone does for ABS, but it also smells similar and might be as dangerous as Acetone to your health if you do not properly handle it, so you should be extra careful when working with any of the solvents mentioned here. It is a wise idea to wear gloves and work in well ventilated area, so you will not be inhaling the fumes of the solvent you are working with, also be very careful when handling any of the mentioned solvents – Acetone, MEK or THF as they are all very flammable. Do note that Acetone is the easiest and most widely available solvent of the mentioned ones and you may have trouble finding or obtaining any of the others mentioned, so do check locally if they are easily accessible. Another safer for handling alternative that is supposed to work with both ABS and PLA 3D print (as well as many others) is a special product dubbed as high performance 3D print coating called XTC-3D from Smooth-On. It has been getting some attention lately among the 3D printing community, though people are reporting mixed results after trying it out. The product is essentially an epoxy coating consisting of two liquids that are mixed together and then brushed onto any 3D print, the coating is supposed to self-level and wet out uniformly without leaving brush strokes. Working time is 10 minutes and cure time is about 4 hours and after that the XTC-3D should have cured to a hard, impact resistant coating that can be sanded, primed and painted. The problem with the Smooth-On XTC-3D is that it is not widely available, might be easier to obtain in US, but we could not find it available anywhere in Europe or a place to order it from that will deliver here, so that could be a serious problem. Other alternatives include priming and sanding the model and then maybe painting it or painting with PlastiDip rubber like coating directly.